Our funeral homes are family owned and operated businesses. We are large enough to give our families the same service as the largest funeral homes around, yet we are small enough that each family gets the level of attention and care they deserve. Justin Rasmusson was born in Nevada and grew up on a farm outside of Zearing. He graduated in 2002 from Colo-Nesco High School. He then obtained his Associates Degree from Des Moines Area Community College in 2005. He then enrolled in the Mortuary Science Program at DMACC, graduating in 2006. Starting 2002, Justin worked for Hamilton's Funeral Home in Des Moines. He completed his internship, and obtained his funeral directors license in 2007; and continued working there until February of 2010. He started with Bacon Funeral Home in March of 2010 and in January of 2016, Justin purchased the Bacon Funeral Homes in Nevada and Maxwell, and in March of 2019 Ryan Funeral Home in Nevada was purchased. The funeral homes were then changed to the name Rasmusson-Ryan. 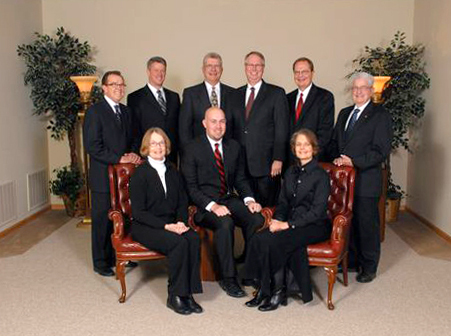 Justin is a member of the Nevada Kiwanis Club and the Iowa Funeral Directors Association. Funeral service is a passion for Justin, something he feels one must have to succeed. Justin is the son of Larry & Angela Rasmusson. Larry & Angie live in Nevada and own Midwest Pack. He enjoys camping, his Boston Terrier, Mimi and his French Bulldog, Wendell. Justin also enjoys traveling and spending time with his family and friends.